The MAX4410 stereo Headphone driver is designed for portable equipment where board space is at a premium. The MAX4410 uses a unique, patented, DirectDrive architecture to produce a ground-referenced output from a single supply, eliminating the need for large DC-blocking capacitors, saving cost, board space, and component height. The MAX4410 delivers up to 80mW per channel into a 16 load and has low 0.003% THD+N. A high power-supply rejection ratio (90dB at 1kHz) allows this device to operate from noisy digital supplies without an additional linear Regulator The MAX4410 includes 8kV ESD protection on the Headphone outputs. Comprehensive click-and-pop circuitry suppresses audible clicks and pops on startup and shutdown. Independent left/right, low-power shutdown controls make it possible to optimize power savings in mixed mode, mono/stereo applications. 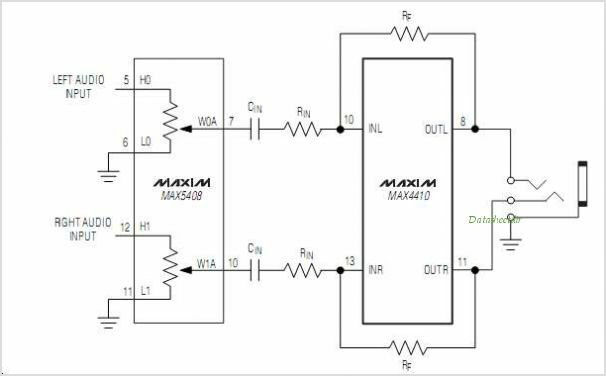 The MAX4410 operates from a single 1.8V to 3.6V supply, consumes only 7mA of supply current, has short-circuit and thermal overload protection, and is specified over the extended -40C to +85C temperature range. The MAX4410 is available in a tiny (2mm x 2mm x 0.6mm), 16-bump chip-scale package (UCSP") and a 14-pin TSSOP package. This is one package pinout of MAX4410,If you need more pinouts please download MAX4410's pdf datasheet. 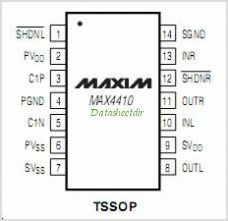 This is one application circuit of MAX4410,If you need more circuits,please download MAX4410's pdf datasheet.